Bonny Schumaker from On Wings of Care has been very busy flying the Gulf lately. 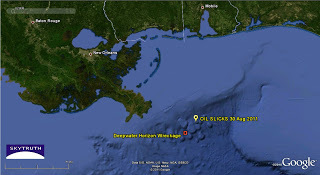 Yesterday she flew out over the site of the BP / Deepwater Horizon oil spill. About 16 miles northeast of the spill site, she ran across extensive oil slicks that look to us like a lot more than the typical natural oil seep normally produces. Check out her report with a photo gallery and video. 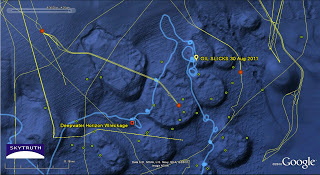 There is a known seep location less than 2 miles to the south. The nearest oil platform is 8 miles to the east; the closest pipeline is >5 miles to the northeast. 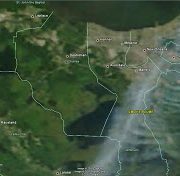 MODIS satellite images taken yesterday afternoon showed nothing unusual in the area, and the most recent radar image for the site was taken back on August 26. We’ll keep looking and let you know what we learn. 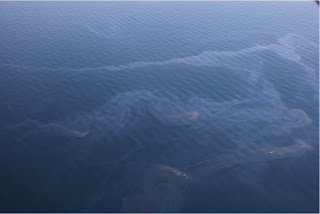 Oil slicks on August 30, 2011 about 16 miles northeast of the BP / Deepwater Horizon spill site. Photograph courtesy Bonny Schumaker / On Wings of Care. 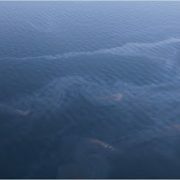 Location of oil slicks documented by Bonny Schumaker on August 30, 2011. BP oil spill site (Deepwater Horizon wreckage) shown for reference. 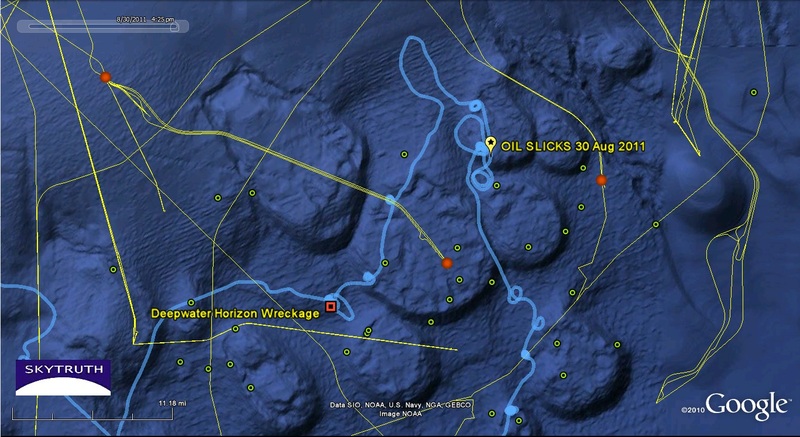 Map showing August 30 flight line (pale blue), seafloor oil and gas pipelines (yellow), oil and gas platforms (orange dots), natural oil seeps (green dots), and BP oil spill site relative to slicks observed on August 30. Backdrop is shaded-relief bathymetry (seafloor “topography”). 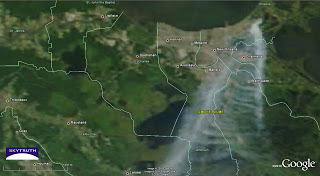 Detail from MODIS/Terra satellite image taken on August 29, 2011. But the brown plume in Raritan Bay just above the right corner of our logo shows sediment coming from runoff into the Raritan River. 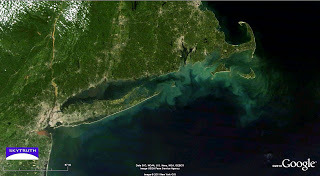 The Hudson River north of Manhattan is bright orange-brown, also full of sediment and other surface runoff that hasn’t quite made it to the coast yet. This runoff can be pretty nasty stuff, laced with untreated sewage, agricultural chemicals, oil and other miscellaneous gunk. 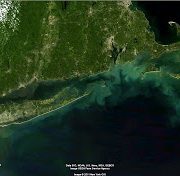 We expect to see major plumes of runoff in the coastal waters up and down the eastern seaboard this week as the torrential rain dumped by Irene works its way to the ocean. 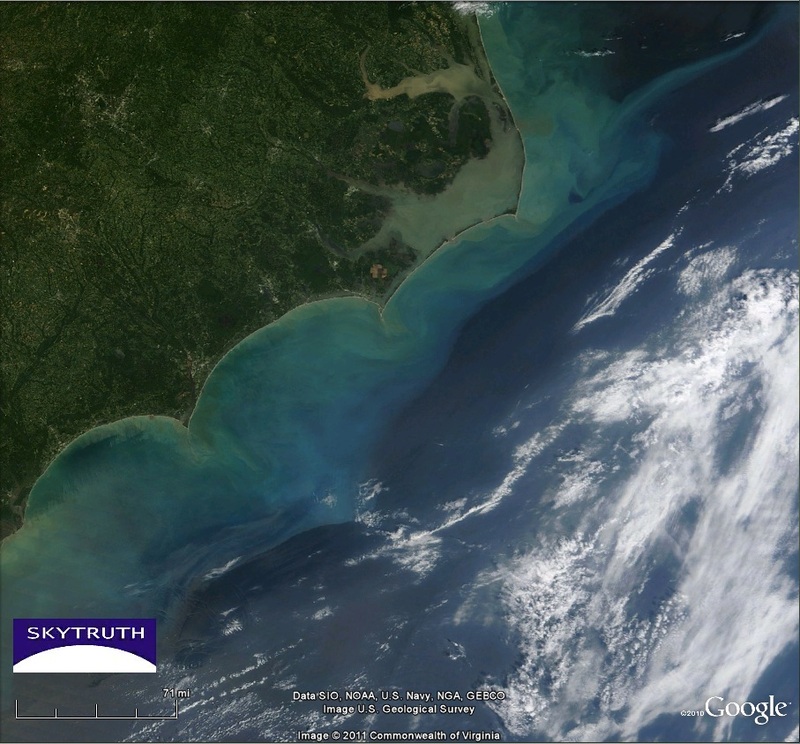 Detail from MODIS/Terra satellite image taken August 28, 2011, showing the Carolina coast. 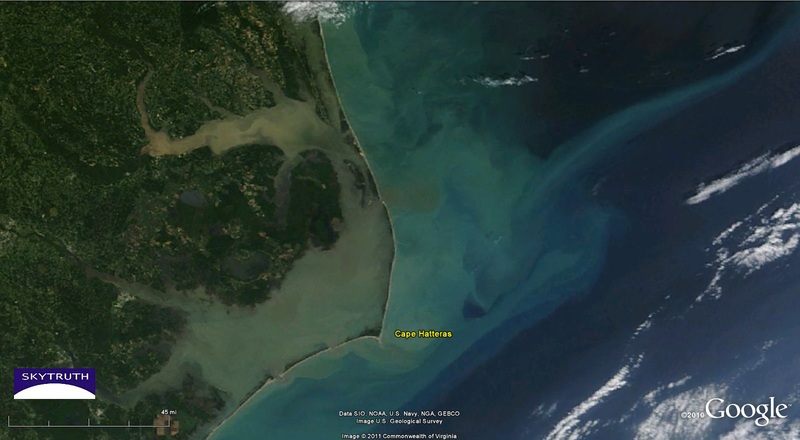 Cape Hatteras is near top center. Turbid coastal waters laden with sand are bright turquoise. Detail from August 28, 2011 MODIS satellite image showing tubidity in Pamlico Sound, Albemarle Sound, and offshore along the Outer Banks of North Carolina. Pale blue – turquoise colors offshore indicate water carrying suspended sand; brownish areas in Sound, and plumes issuing into the ocean through inlet channels in the barrier islands, indicate water carrying sediment and other onshore runoff. 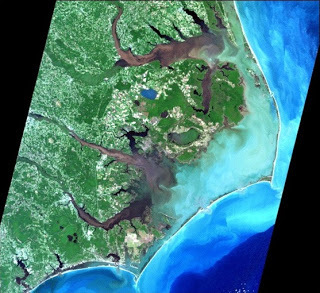 Detail from Landsat-7 ETM satellite image of North Carolina’s Outer Banks taken September 23, 1999 in the wake of Hurricane Floyd. 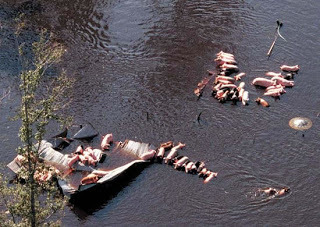 Aftermath of Hurricane Floyd in 1999. Detail from MODIS satellite image taken August 28, 2011 showing smoke from burning marsh drifting over eastern and southern new Orleans. 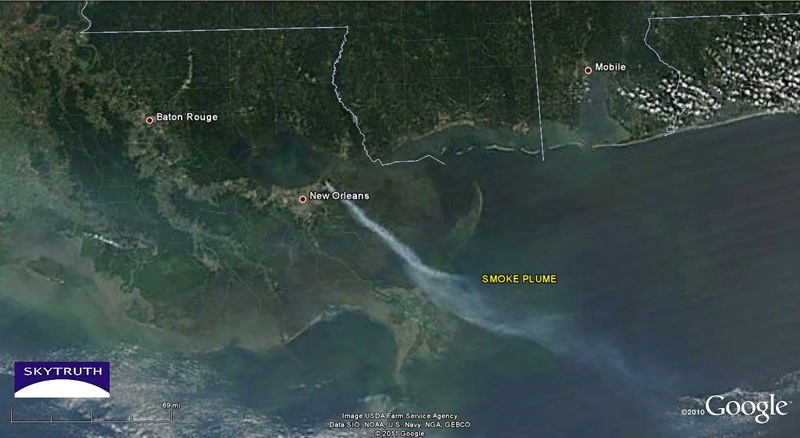 Thick smoke was drifting yesterday over the communities of Chalmette, Braithwaite, Marrero, Galliano, Chauvin, Dulan and Theriot, then heading out over the Gulf, making a visible plume that extended nearly 300 miles from the source of the fire – much longer than the smoke plume we observed while the Deepwater Horizon rig was burning last April. 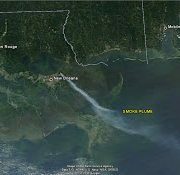 Detail from NASA/MODIS satellite image taken August 27, 2011 showing 200-mile-long smoke plume originating on the east side of New Orleans. We tweeted about this at 7:14pm eastern, and in the wee hours this morning @dmyersloyola replied that we’d identified a large wildfire burning in a marsh on the edge of town. (Are you following us on Twitter yet?) Here’s a video report on the fire. It’s extremely smokey, a serious air-quality problem and public health concern for nearby residents. It was possibly triggered by lightning.